All sunglasses are designed to shield your eyes from bright sunlight. Many sunglasses go a step beyond and also promise protection from ultraviolet (UV) light rays and other types of natural radiation from the sun. Protecting your eyes from these damaging rays is essential for keeping your eyes healthy. Choosing the right pair of sunglasses can make all the difference. What Should You Look for in Sunglasses? Color and style are not the most important factors in choosing sunglasses. Their ability to block light and harmful UV rays matters most. Sunglasses should block 99 to 100 percent of UV rays. Look for sunglasses with this feature. Both plastic and glass lenses can absorb some UV light. UV absorption is greatly improved, however, in sunglasses where a special coating is applied to the lens or a chemical is added to the materials in the lens during production. Check lenses to make sure they also block out enough visible sunlight. A good pair of sunglasses should block out at least 75 percent of visible sunlight. The lens should be dark enough to obscure your own eyes. Buying wraparound sunglasses can further enhance eye protection. These type of sunglasses block light from entering in around your temples and further limits exposure to dangerous UV rays. 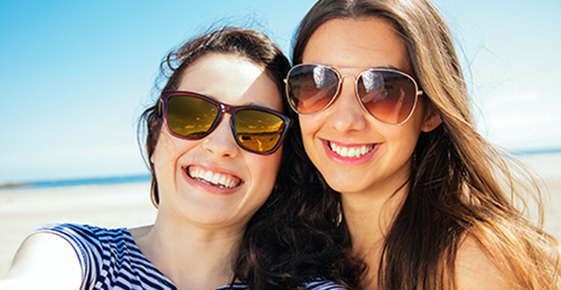 Sunglasses have plenty of extra features that can enhance their ability to protect your eyes. Consult with your eye care professional to see what features will help protect your eyes from being damaged. Some eyeglasses feature polarized lenses. These are helpful in reducing glare from light bouncing off water, snow or paved surfaces. Sunglasses made with polarized lenses are especially useful when driving, boating, bicycling or doing other outdoor activities. If you are looking for sunglasses that will work in outdoors and indoors, photochromic glass lenses can offer a good solution. The photochromic lens automatically darkens when exposed to bright light and becomes lighter again in low light. This feature is popular with people who already need to wear prescription eyeglasses to improve their vision. Select impact resistant sunglasses. No lens is totally immune from breaking. Plastic lenses are much more durable, however, than glass lenses when struck by a hard object. They are less likely to shatter and cause potential injuries. Longer lasting eyeglasses will do more to keep your eyes from suffering long-term damage related to sunlight exposure. EyeCare America. “Sunglasses.” The Foundation of the American Academy of Ophthalmology. Glaucoma Research Foundation. “A Guide to Sunglasses.” April 16, 2013.